Posted June 26, 2013 by finnfemme & filed under Daily Life, Fashion, Vintage. When I think of how much soda people drink these days, it’s always refreshing to see how they drank it in days of yore. 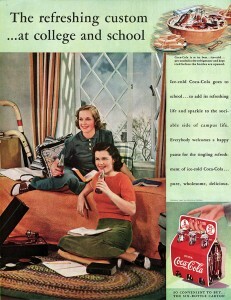 This fab 1939 Coca-Cola ad depicts two college co-eds in their dorm room, drinking bottles of Coke. 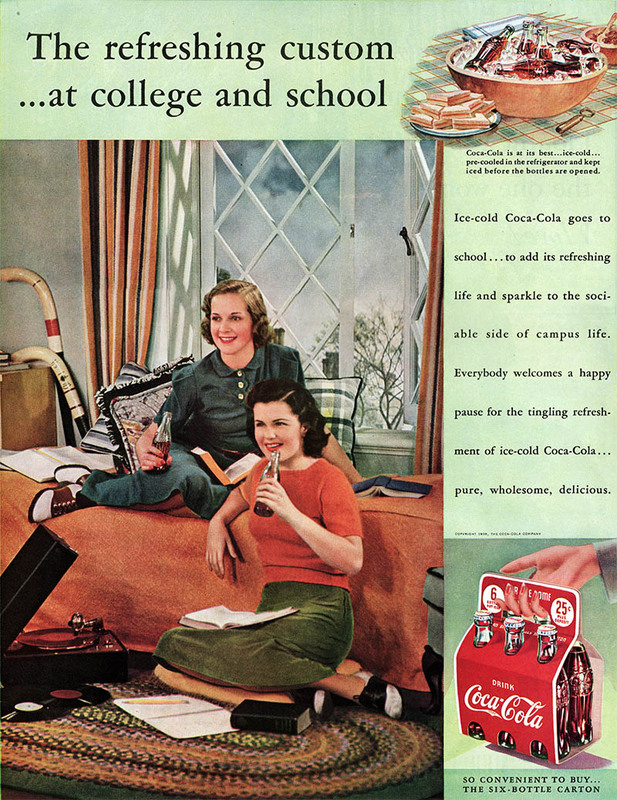 “Ice-cold Coca-Cola goes to school…to add its refreshing life and sparkle to the sociable side of campus life.” The girls look the picture of glowing youthful health, sitting there amongst the trappings of a hip ’30s dorm room. Portable record player playing albums on the floor, field hockey sticks propped in the corner, and books and papers strewn about. I love their saddle shoes and cute skirt and sweater sets. What is most surprising is the size of the Coca-Cola bottles! In thick glass, they look positively miniature in the girls’ hands. I can’t imagine there being more than 6 to 8 ounces of liquid in those bottles. 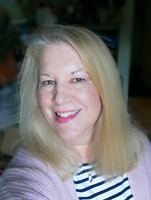 And Coca-Cola was treated as an aside; “a happy pause for the tingling refreshment…”, not something to be guzzled with great abandon throughout the day. It was 25 cents (plus deposit) for a six-bottle carton – the entire six pack looks about the size of the woman’s hand!